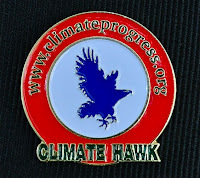 We are all Climate Hawks now. 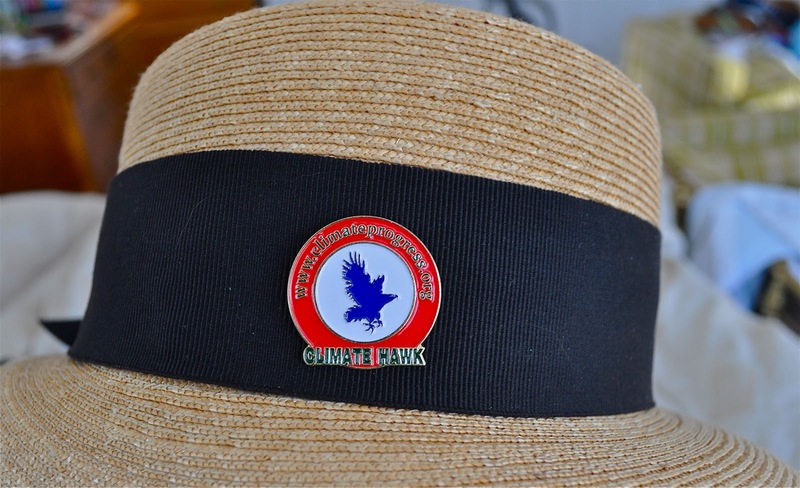 After much discussion and some dissent in the blogosphere, there appears to have emerged a consensus (yes - one of those) around a concise terminology to describe our position with one visceral, graphic logo, and that label - CLIMATE HAWK - is now, at last, not merely a label, but a LAPEL! PIN, that is. 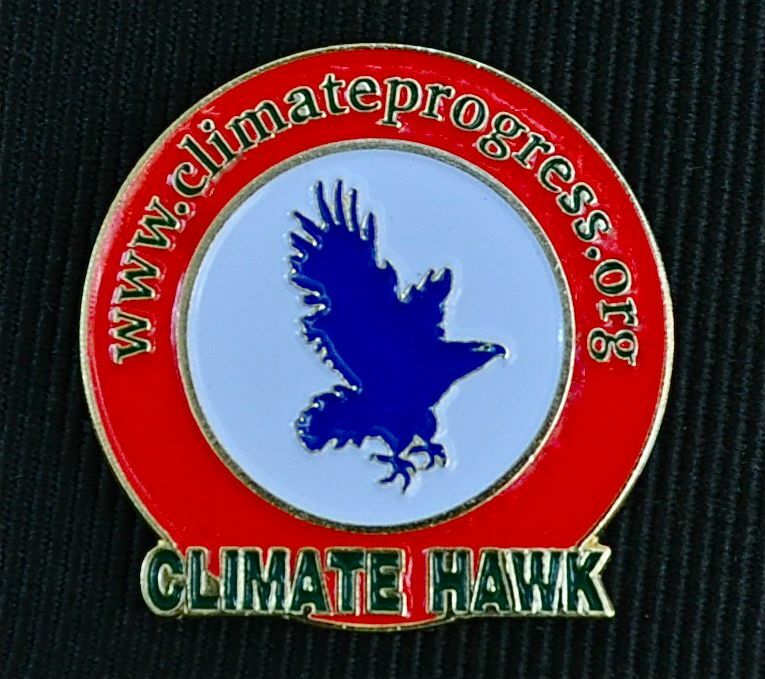 At last, you can now order the very first Climate Hawk lapel pin ever produced. Why is a pin so essential?? You can wear it to your workplace, to the library or grocery store, to class, or the kid's soccer games - and start a conversation effortlessly. The imagery of a climate hawk lends itself brilliantly to a contrast with, let's see...cowardly climate chickens, stubbornly ignorant climate ostriches, deliberately denialist climate zombies, pathetic losers like climate turkeys, and obsolete, dirty-energy addicted climate dodos. The link on the border for ClimateProgress.org leads to a unique compendium of information, from the most basic facts for the novice, to highly sophisticated aspects of the science and politics. This pin was designed to appeal to Americans, since America, historically the major emitter of climate changing greenhouse gases, has a unique obligation and ability to take the lead in the essential global transition to a new paradigm of sustainability and safe sources of energy. But it should have universal appeal as well, and ideas for different color schemes and designs, and suggestions for links to educational websites are welcome and will be considered for future runs. Oh, and not to mention, they make a wonderful gift for Valentine's Day! All proceeds go towards supporting climate change education, and producing more pins. Special thanks to RPauli for being the very first to purchase! $10.00 includes shipping in the continental USA and Canada. Click here to order. No news to me or Gail, but Ron Reagan in a new book says his father had Alzheimer's Disease while in the White House. Michael Reagan denies the story. Fair and unbalanced! Unfair and but rebalanced! So who pulled the strings that made the thespian speak? Well, Catman, that just results in a very interesting conjecture - does it mean that the (s.elected) president is merely a puppet, and doesn't even need to possess mental faculties but simply the ability to mindlessly parrot talking points like a stupid robot, like Reagan and both Bushes or maybe read scribbled crib notes from a palm like Sarah Palin - or else be beholden to much greater forces like Clinton and Obama? I suppose those of us who communicate on the web and propose seditious thoughts like this are being monitored, and tolerated by the powers that be to prove that we have a free and open and democratic system - and as soon as any actual real threat to the status quo and obscene profits becomes realized, we will be abruptly silenced - and the intertube access will be eclipsed with the push of one button. Are you on Twitter Gail? I would like to follow you if you are? I guess I should look into Twitter! Its very easy to sign up you could sign up as your blog name. Your blog is so awesome I know a lot of people WHO CARE about EARTH will follow. Heh, I might be too old to figure out how to do it!